On July 21, 2017, Biola Campus Safety Chief John Ojeisekhoba was presented with the 2017 National Clery Compliance award by the National Association of Clery Compliance Officers and Professionals (NACCOP). This award acknowledged Chief Ojeisekhoba’s outstanding leadership in an 8-year process to improve Biola’s compliance with the Clery Act, a consumer protection law that aims to provide transparency around campus crime policy and statistics. 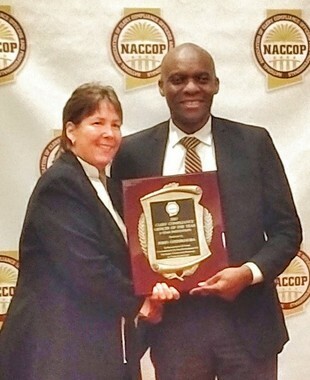 Each year, the NACCOP award recognizes a current practitioner who has contributed significantly to the development or refinement of Clery Act compliance programs at his or her university. In November 2015, Chief Ojeisekhoba initiated an audit of Biola’s current Clery compliance. His team then provided training presented by Clery Act experts, and later by himself, to Campus Safety officers, as well as key officers in various applicable departments. He also secured funding for a part-time Clery Compliance Officer position, to assist in the collection of data for accurate incident records management and crime log reporting. Chief Ojeisekhoba and his team also worked to enhance the Clery-related resources available on Biola’s campus. "This award shows Chief Ojeisekhoba's commitment to excellence for our students," said Justin Shelby, Administrative Operations Manager. "Without his leadership and guidance we would not have the robust Clery compliance program that we do today." He made it a priority to provide the best communication services to students in the case of an emergency, including the Emergency Notification System message system and the Public Address (PA) speaker system, to give timely warnings of campus-wide emergencies. Additionally, Chief Ojeisekhoba was able to ensure Campus Safety could lock all card reader doors at once with a press of a button in a lockdown situation. “Chief believes it truly took the effort and teamwork of so many to make this possible and is sincerely grateful to the department's Clery compliance team, partners across campus, and university leadership who continue to support and play unique roles in implementing the tasks associated with these challenging federal regulations,” said Richardson. Campus Safety’s accomplishments under Clery Act compliance have played a role in helping Biola University achieve several years of low crime ratings. Biola was recently ranked the #1 safest school in the state of California by Niche. To read more about Campus Safety services, visit the Biola Campus Safety website. Congratulations! As a parent of a Biola student safety is paramount. Your character as demonstrated through leadership of this department is outstanding. You are a wonderful asset to the Biola community.